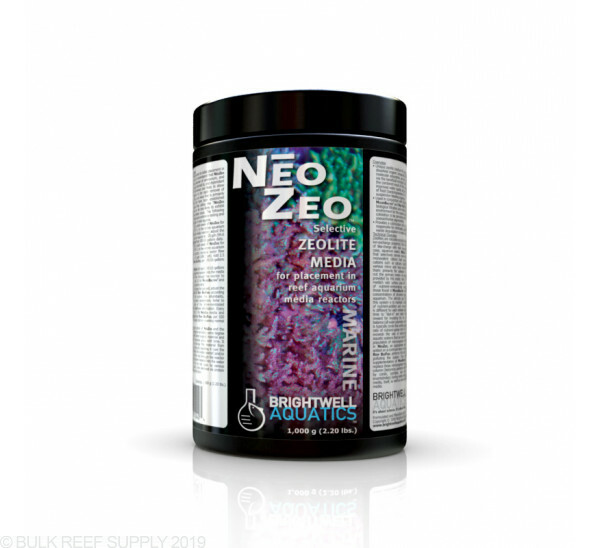 Used in conjunction with Brightwell Aquatics MicrōBacter7 and Reef BioFuel, helps establish biological filtration and maintain an ultra-low nutrient environment for the express purpose of enabling coral coloration to be perceived without interference from zooxanthellae pigmentation. Rinse material in freshwater prior to initial placement in aquarium system. It must be remembered that NēoZeo is an extremely-effective adsorber of ammonium, and corals that have become accustomed to, and dependant upon, the presence of ammonium are likely to show an initial negative response to the rapid removal of this ion. As expected, this is an issue that is primarily encountered in aquaria that have been established for many years; aquaria that utilize the “NēoZeo system” from the onset are far less-likely to exhibit this sort of ammonium-related issue. The following recommendations are based upon extensive testing and will produce the best results in most aquaria. Weeks 1 and 2: Place 200 g each week of NēoZeo for each 100 US-gallons (378.5 L) in the entire aquarium system into an appropriate media reactor; adjust the rate of water flow through the reactor to ~25 gph (94.6 lph). Add 5 ml MicrōBacter7 per 100 US-gallons daily. Weeks 3 and 4: Add 200 g each week of NēoZeo for each 100 US-gallons (378.5 L) in the entire aquarium system into the media reactor; increase water flow through the reactor to ~50 gph (189.3 lph). Add 2.5 ml MicrōBacter7 and Reef BioFuel per 100 US-gallons daily. 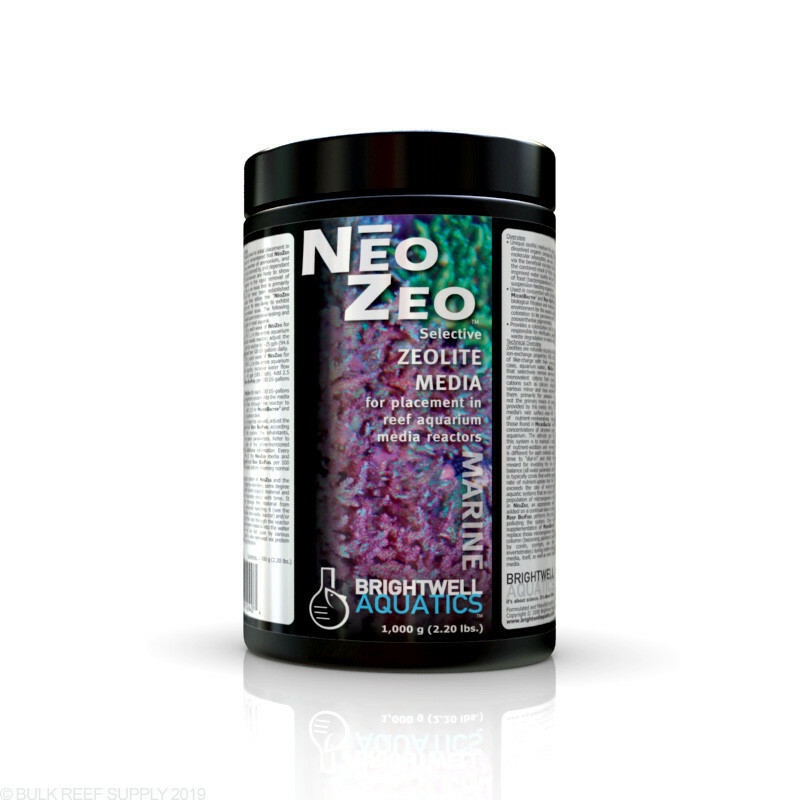 Week 5: Add 200 g of NēoZeo for each 100 US-gallons (378.5 L) in the entire aquarium system into the media reactor; increase water flow through the reactor to ~100 gph (378.5 lph). Add 2.5 ml MicrōBacter7 and Reef BioFuel per 100 US-gallons daily. Once the first 5 weeks of usage has passed, adjust the dosage of MicrōBacter7 and Reef BioFuel according to the appearance of the system, the inhabitants, and as dictated by the water parameters. Refer to the instructions on each of the afore-mentioned supplements’ labels for additional information. Every six-weeks, change 25% of the NēoZeo media and add 2.5 ml MicrōBacter7 and Reef BioFuel per 100 US-gallons daily for one week before resuming normal dosing schedule. Due to the highly-porous nature of NēoZeo and the rate at which it is colonized by microbes, some degree of surface impaction with latent organic material and microbial biomass will invariably occur with time. It is important to gently dislodge this material from the NēoZeo media by physically handling it (see the instructions that accompany the media reactor) and/or by briefly increasing the flow rate through the reactor to help blow some of the latent material into the water column. This material will be fed upon by various aquarium inhabitants and is also removed via protein skimming and mechanical filtration. Zeolites are naturally-occuring minerals that have specific ion-exchange properties; they essentially exchange ions of like-charge with their surrounding medium (in this case, aquarium water). NēoZeo is a blend of zeolites that selectively remove ammonium and certain other monovalent cations from seawater (leaving divalent cations such as calcium, magnesium, strontium, and various minor and trace elements alone), exchanging them primarily for potassium ions, however this is not the primary means of water quality improvement provided by this media; rather, the colonization of the media’s vast surface area with the appropriate types of nutrient-remineralizing microorganisms, such as those found in MicrōBacter7, serves to deplete existing concentrations of dissolved organic material from the aquarium. The ultimate goal for hobbyists employing this system is to maintain a balance between the rate of nutrient-addition and -removal/uptake; this balance is different for each individual aquatic system and takes time to “dial-in” and obtain the desired result. The reward for investing the time required to attain this balance (all water parameters and lighting being optimal) is typically corals that exhibit spectacular coloration. The rate of nutrient-uptake that this system achieves often exceeds the rate of nutrient-addition, particularly in aquatic systems that are rarely-fed. To help maintain the population of microorganisms that become established in NēoZeo, an appropriate carbon source should be added on a continual basis to ensure population viability; Reef BioFuel performs this task efficiently and without polluting the system. Once established, occassional supplementation of MicrōBacter7 is recommended to replace those microorganisms that are lost to the water column (becoming planktonic and available for predation by corals, sponges, and other suspension-feeding invertebrates) during routine disturbances to the NēoZeo media, itself, as well as when replacing a portion of the media.